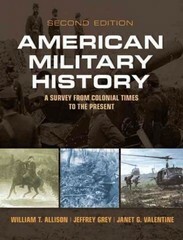 American Military History 2 Edition Serves as a foundation for undergraduate courses in American military history. American Military History is uniquely tailored to American military history courses. Organized chronologically, the text begins at the point of European conflict with Native Americans and concludes with military affairs in the early 21st century. The content and style will appeal to history majors and non-majors and is designed to allow instructors flexibility in the structure of their course. Learning Goals Upon completing this book readers will be able to: Understand the central themes and events in the American military history Relate these themes to American history as a whole\ Know the issues beyond war that have contributed to the American military experience Note: MySearchLab does not come automatically packaged with this text. To purchase MySearchLab, please visit: www.mysearchlab.com or you can purchase a ValuePack of the text + MySearchLab (at no additional cost): ValuePack ISBN-10: 0205912133 / ValuePack ISBN-13: 9780205912131.